^ a b Butters, Alan (December 2006). “Radio Frequency Identification: An Introduction for Library Professionals”. Australasian Public Libraries and Information Services 19 (4): 164–74. ISSN 1030-5033. http://search.informit.com.au/documentSummary;dn=312996058408409;res=IELHSS. ^ a b c Sing, Jay; Brar, Navjit; Fong, Carmen (2013). 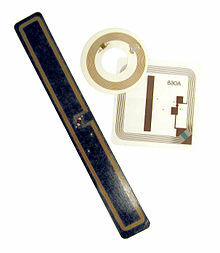 “The State of RFID Applications in Libraries”. Information Technology and Libraries 25–32. doi:10.6017/ital.v25i1.3326. ^ Wadham, Rachel (2003). “Radio Frequency Identification”. Library Mosaics 14 (5): 22. ^ Dorman, David (December 2003). “RFID Poses No Problem for Patron Privacy”. American Libraries 34 (11): 86. http://www.ala.org/PrinterTemplate.cfm?section=archive&template=/ContentManagement/ContentDisplay.cfm&ContentID=50931.